2017 was a busy year in Forest Park. Construction was completed on Government & Wells Drives, ground was broken on Central Fields, and the Liberal Arts Bridge was rebuilt. We welcomed our largest volunteer group to date, planted over 38,000 tulip bulbs, rebuilt Kennedy Forest's vernal pond and saved dozens of turtles. We worked alongside our City of St. Louis partners all year to make sure Forest Park was as welcoming as possible for our 13 million annual visitors. 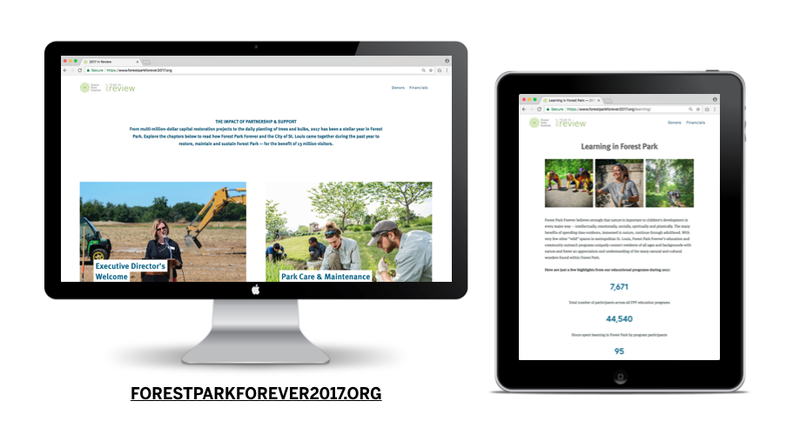 Visit Forestparkforever2017.org to read about even more of what we were up to last year, and to see a list of those individuals, corporations and foundations whose generous gifts made our work possible. Thank you for helping make every year a great year in Forest Park!